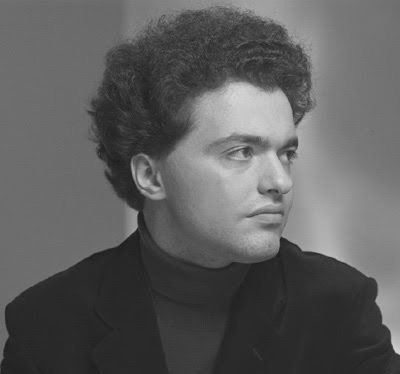 Evgeny Kissin returned triumphantly to Washington for his biennial Washington Performing Arts Society-sponsored recital, on Sunday afternoon in the Kennedy Center Concert Hall. Both his recitals and his recordings have come in for some high praise here at Ionarts, and this performance was no less laudable. Kissin's best playing, as shown in the live recording made at the 2006 Verbier Festival, is in Chopin, providing just the right combination of loneliness and technical furor. Even better balance can be provided by Kissin's other specialty, demanding Russian repertoire, as found in his 2005 Strathmore recital (Medtner, Stravinsky's Pétroushka Suite) but not his 2007 recital (restrained Schubert, excellent Brahms and Beethoven). The music of only two composers passed through Kissin's hands this time, in a beautifully unified program of Prokofiev and Chopin. Opening with Prokofiev's Three Pieces from Romeo and Juliet, op. 75, Kissin captured Juliet's flightiness in restless runs, the wild romp of Mercutio's Queen Mab speech, and the heavy-footed dance of the Montagues and Capulets, orchestral in scope and marvelously differentiated in voicing. That was a pleasing overture to the meat of this recital, an unforgettable performance of Prokofiev's eighth sonata (B-flat major, op. 84). From the opening note of the first movement (Andante dolce), which Kissin set gently and sweetly in place with such deliberate care, this was a display of patient craftsmanship, alternately elegiac and then restive in the inquieto sections. The piece has never much appealed to me, by comparison to the flashier Prokofiev sonatas (no. 2, no. 7), but Kissin's case was persuasive, giving the second movement (Andante sognando) the feel of someone fallen asleep outside a dance hall, with chromatic chord alterations soft-pedaled and Kissin's velvety touch making time seem to stand still. Finally, the third movement (Vivace) was an outrageous toccata that rumbled with trumpet-like fanfares through to its booming conclusion. In a less bombastic all-Chopin second half, the Polonaise-Fantasie (A-flat, op. 61) had a wandering, improvisatory quality that evolved seamlessly into more metered polonaise sections, with an appropriately operatic abandon in the right hand's Bellini-esque flights. The multiple-trill section was flawless and fluttering, and the immense ending had just enough technical perfection while also giving the sense of being emotionally off the hook. A set of three mazurkas showed Kissin stretching the tempo too much at times (op. 41, no. 4) but hitting just the right melancholy tone of Chopin's mal de pays in others (especially op. 59, no. 1). The concluding set of etudes, a selection from opp. 10 and 25, appeared to get Kissin slightly flustered because the audience applauded after an astounding performance of op. 10, no. 12 4, as well as when the set actually ended (after another passionate "Revolutionary" etude). Most startling to my ears were the three selections from op. 25, a sparkly, not buffoonish "wrong note" etude (no. 5), geysers of thirds at impossible speeds (no. 6), and a supremely polished no. 11. As if the first half were not enough of an indication that Kissin should record more of the Prokofiev solo literature, he focused on Prokofiev in his three encores. (After hearing eight encores in 2007, one could not help feeling a little disappointed.) After a fluid, expansive Chopin nocturne (op. 27, no. 2) Kissin brought down the house with two Prokofiev selections, Devilish Inspiration, Op. 4, No. 4 and the March from Love for Three Oranges. Both were hard-fingered heart-stoppers, just the way this kind of Prokofiev works best. Compare Russian pianists with the next concert from WPAS, a recital by Olga Kern at Strathmore (March 22, 4 pm). Charles: I think the etude you meant, when you reported the audience's unexpected applause, was Opus 10, No. 4. I don't think Kissin was flustered at all. In fact, I suspect he was pleased. He had just matched the tempo in Richter's legendary performance of the piece. (You can find it on YouTube-- it's from Monsaingeon's "Richter: The Enigma.") In fact, Kissin may have surpassed Richter's performance. It was indeed, as you say, astounding. Steve -- Quite right, not no. 12, which is the Revolutionary, but no. 4. Sorry for the confusion. I did not mean to imply flustered in a way that impacted his performance, which I don't think the applause did. Only that it upset the order. He seemed to want to continue right into the op. 25 etudes after the Revolutionary, as if one break for applause were enough. Thanks for the Richter note -- a very good point indeed. It's amazing: when I heard Evgeny Kissin playing the same program at the Lucerne Festival, we exactly did the same, applaud after Chopin op.10 n°4! As if we could no longer wait to express our gratitude and admiration.